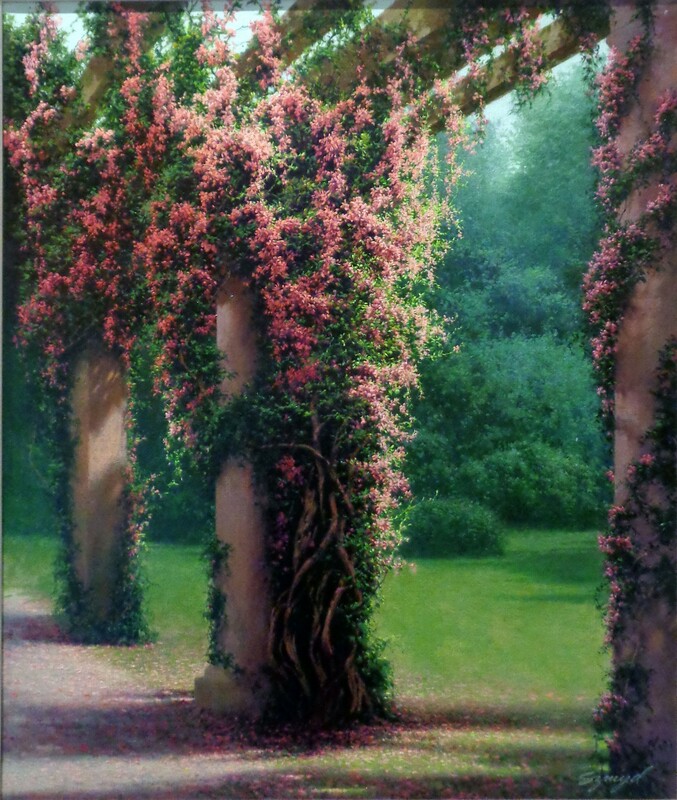 Born on June 9, 1933 in Trafford, Pennsylvania, Edward Szymd, son of Antoni and Blanche Frydrych Szymd, had decided upon a career as an artist by the age of nine when he won first prize in a community art show. During his high school years, he used his free time to study the work of various artists at the Carnegie Museum. Years later, he declared, “I started painting at the age of nine. It wasn’t possible to change my environment but on canvas I could make things look anyway I wanted.” After he graduated from the Art Institute in Pittsburgh, he moved to Florida in 1950, renting a room from a local couple who became a second family and starting a career as a commercial artist. Szymd painted landscapes and still-lifes on the side, selling them along Las Olas Boulevard in Fort Lauderdale for a thousand dollars a canvas until he had accumulated enough of a following to devote himself full time to fine art. I prefer not working on location. The light changes so quickly and there are the problems of the elements. After going on a research trip for a special subject, I usually come back with enough reference to keep me busy for a year. I choose a subject, photograph it, and proceed to paint it as idyllically as possible. Once the painting is started, the photograph is discarded and the creative process begins. The work is time consuming and many months may pass before I am sufficiently satisfied to release a particular painting. Under the final paint surface are many stages of development. Each painting presents a different problem. The painting is signed when all the problems are solved and there is nothing more I can do, at this point in my career, to improve the work. Edward Szymd passed away at the Blowing Rock Hospital in 2004. He left behind a stunning array of paintings completed during a highly prolific career, and his work continues to be highly sought after by collectors around the world.